This past winter, China Glaze came out with the Seas and Greetings collection - a different take on the typical reds and greens holiday collection. 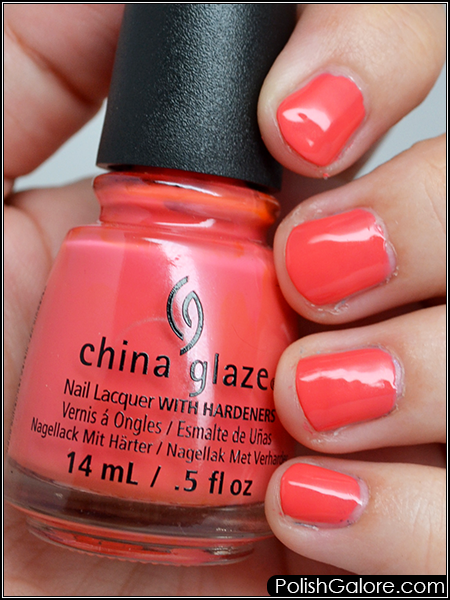 The motivation was the warm winters in California where China Glaze is located. I was mixed on it because while I definitely wear polishes all year long, I feel like I was longing for my typical reds and greens during December so this collection just sat at my desk. Today, however, I felt like wearing something bright and cheery. I'm on a bowling league (and I'm terrible) but there's something about painted nails that just make me feel happy. I pulled out Warm Wishes, a watermelon creme. I used a base of Duri Rejuvacote, 2 coats of polish and finished with Glisten & Glow HK Girl top coat. The formula on this polish was a bit runny so I had to wipe my brush an extra time to catch the lacquer from the top of the brush. With careful thin coats, I didn't flood my cuticles and had little clean up required. Also, my nails are STILL trashed from my acrylic experience. I hope that within the next 4 weeks, it will all be grown out and I can start growing my nails out again. Right now, I'm have to cut them off as soon as the distal (also called the free) edge appears because it's so paper thin. Additionally, I now have a hard "bump" on my left thumb which may be injury to the nail where the acrylic was drilled down. Regardless, I miss my sturdy nails and can't wait to see them again soon. 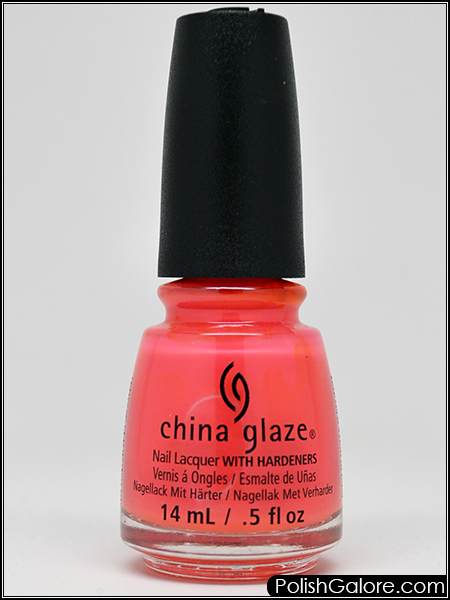 I do love that China Glaze has a lot of "staple" colors in their collections - things that go well with anyone but are also good starting points for nail art. I tend to wear straight cremes to work with the occasional shimmer and keep my holos and glitter to the weekends, so I find this polish a good one to have in my stash. I'm still working to move all my polishes into my guest room and now I have guests coming in May so I need to get myself moving! Overall, I do enjoy this color - as I mentioned before, thin coats and extra wiping of the brush and you'll have no issues.